Judging from our sales records, it is apparent that many people are looking for more style and speed for their golf car. That’s all great, but because of our background in the beautiful and steep Appalachian Mountains of northwestern North Carolina, we also worry about getting those fast cars to stop safely. (Little Known Facts: North Carolina has over 50 peaks over 5,000 feet. Our retail store is at the foot of Grandfather Mountain, which is the tallest mountain in the Blue Ridge Mountain Range at 5,964 feet). Let’s look at a few on this list for now and we’ll cover the rest in Part II and Part III. Be sure to read our newsletter for the links to view the whole series as it unfolds. In the golf car business we worry about three issues from a safety standpoint: STOP, START, & TURN (SST, as a good industry friend of ours puts it). If the car doesn’t start, then the other two are irrelevant. If it does, then the stopping and turning become very important safety issues, because if it doesn’t do either, you have an out of control golf car. In the early days of golf cars, brakes were frequently attached to the motor or the differential input shaft in some fashion. This was not very satisfactory in many cases, because if a rear wheel came off the ground, the brakes would not work. In the early 1970’s, automotive style wheel brakes became commonplace in the industry. Club Car used a hydraulic brake system through 1979, but after that Club Car, E-Z-GO, and Yamaha employed cable activated rear wheel brake systems. They have never looked back. The early, pre-80 E-Z-GO wheel brake system we call the old Bendix brake system. The same Bendix brake system was also used by Pargo, Davis 500, and some Cushman golf cars & trucksters. In 1978, Yamaha introduced a manual adjusting Japanese brake system that Club Car and E-Z-GO also switched to in 1980. In 1981, Yamaha adopted a self-adjusting brake system and E-Z-GO went to a virtually identical system in 1988. Club Car went to that same system in 1994. In 1996, E-Z-GO changed to a self-adjusting Bendix brake system that Yamaha soon adopted as well. Club Car continues to use the Japanese style self-adjusting brake system in 2005. There are fundamental differences between the systems and we will address them in the next newsletter. For now, click on the various links if you want to see the difference between the Japanese self-adjusting brakes and the Bendix self-adjusting brakes. They will show you a simple view, from under the car, of the backing plate and how to tell the differences. Brake care is very important. Like automobiles, golf cars can be lethal weapons if not maintained properly. When used carelessly a golf car can kill or severely injure an innocent bystander or yourself, or cause significant property damage. There are lots of things that can wrong with your brakes to create these types of situations, which is what we will be discussing in this issue. Taking a CLOSE look is the first step. This is not complicated! Get a flashlight, and if you need them, your good glasses. This part will require a close visual inspection. We are going to review what good brake cables, cable connectors, and hill brake catch/accelerator kick-off mechanisms should look like. Club Car, E-Z-GO, and Yamaha each have unique designs in this respect, but the important points are all similar. The brake pedal is a lever that multiplies the pedal pressure, supplied by your foot, to the brake cables. This means you don’t have to press the pedal very hard to effectively slow the car. There are at least two pivot points on every brake pedal and each one has one or more torsion springs to return the pivot to the ‘at rest’ position. The pivot points must not be worn too much and the pivoting parts must be reasonably free to rotate around the pivot. The pedal should not be bent over to one side or the other and it should return freely & fully to the full up position. If you can pull the brake pedal up a little more after releasing your foot then you have a problem. The main brake pedal has a large torsion spring, usually located under the floorboard, to bring the pedal back up. This torsion spring is located very close to the main pedal pivot joint. If the spring breaks or the pivot pin gets rusty or corroded the free &full movement of the pedal is compromised. Proper brake pedal travel is essential to the correct operation of the self-adjust mechanisms inside the brake drum of modern cars. Many brake pedals, over time, can get sticky or the pivot joint wears out making for a floppy pedal…it wobbles side to side. A floppy pedal can make the hill brake catch mechanism not work as well as it should, sometimes not at all. The main pedal pivot pin should be lubricated at least annually. 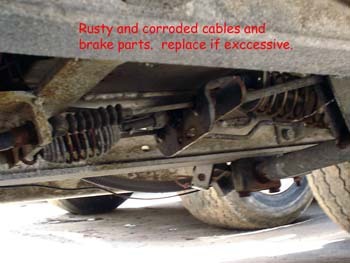 Bad brake cables also can cause pedal problems (see below). Another pivot point on the brake pedal is where the hill brake pedal rotates to lock the brake pedal down. This pivot is not as prone to corrosion but it is prone to wear. It, too, must an operational torsional return spring to properly release & return the hill brake pedal when the accelerator is depressed. The hill brake pivot should not wobble around or be loose in any fashion other than to be free to rotate to engage the lock mechanism. 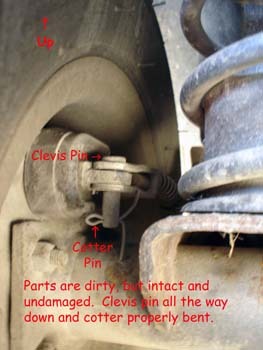 A third pivot point is where the brake equalizer mechanism connects to the brake pedal under the car. The brake cables attach to the equalizer, which spreads out the pulling force of the pedal so the cables create the same amount of braking effort at each rear wheel (in theory, at least). E-Z-GO employs a large spring & clevis device, they call the compensator spring, to help reduce wheel lock up on golf course fairways. The pedals and the linkage from the pedal to the cables should all look OK, not be bent or twisted or out of shape. Most all golf cars/utility vehicles employ cable activated rear wheel brakes only. In recent years, hydraulic brakes and four wheel cable activated brake systems are becoming more common, as ‘golf carts’ take on more diverse applications “off the course”. 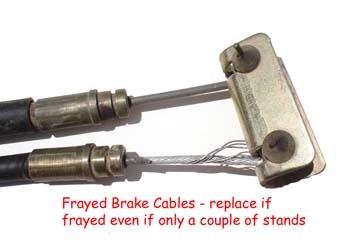 Cable activated brake systems have three main drawbacks. The multi-stranded cables start to break and unravel, sometimes inside the housing so it’s hard to see damage in progress. The second drawback is that they reside immediately under the battery compartment in electric vehicles, thus subject to the inadequacies of proper battery maintenance. 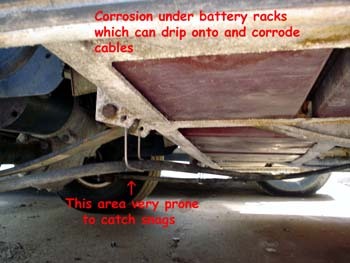 Acid-dripping batteries soon contaminate and start to corrode the cable strands. Coupled with the natural water spray and corrosive golf course fertilizer, the cables really take a beating and may be subject to sudden and unexpected failure. The third drawback is that the cables hang below the chassis and they are vulnerable to snagging stumps, rocks, and any other protruding obstacles they encounter. Bent or severely kinked cables, or kinked or broken cable housings, must be replaced. The loss of braking efficiency due to a broken cable housing is tremendous. The cable housings should not only look good, but they should also be properly anchored at both ends and secured to the chassis so they don’t droop down in harm’s way, able to catch the protruding obstacles previously mentioned. The multi-stranded cable should slide freely within the housing. This allows for smooth brake engagement and full return to the “at rest” position. This free cable movement is essential for the modern self-adjust mechanisms at the shoes to function as designed. If cable replacement is indicated, it is imperative that you order the correct cables for the year, model and brand of your golf car. E-Z-GO, for instance, has had several different brake cable designs, each one replacing the previous design. While inspecting the cables themselves, also pay close attention to the connection points at the pedal and brake backing plate. The cables are usually secured to each with a clevis pin held in place by a cotter pin. Be sure the cotter pin is there and properly bent to not allow the clevis pin to shake loose. Most brake cable housings are secured to a mount bracket with some type of “E” of “C” clip. Be sure these are locked securely in place in the provided groove and have not slipped away from the cable or are in poor or rusted condition. If the cables are rusted, kinked, have broken housings or just look suspicious in any way, shape, or form, seriously consider replacing them…soon. Your personal safety and the safety of those around you is not something you should ignore or skimp on. Depending on your level of expertise, this may be a job to have a professional tackle, as there are critical adjustments to be made both at the pedal, and backing plate, and also within the drums as well. This is way too complicated to thoroughly cover within this context. So, we’ll present a brief overview. Each manufacturer has a different approach to this system, but all accomplish the same end. The hill brake catch mechanism should grab high on the pedal and hold the brake pedal securely. It’s a good idea to grab the brake pedal (on flat ground) and shake it fairly aggressively in an attempt to dislodge the catch mechanism. 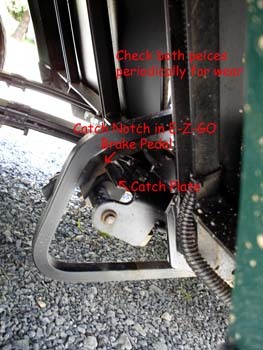 If it stays, your system is most likely in good shape, but a good visual inspection of both the hill brake pedal notch(es) & catch plate (E-Z-GO & Yamaha) or rachet teeth & pawl (Club Car) should also be performed. Usually, it will be fairly evident if either is excessively worn. Consult your car specific service manual to indicate the proper function of your specific mechanism. Rounded off or worn catch notches and/or catch plates may unexpectedly release the hill brake pedal allowing the car to careen out of control. Always, Always, Always, turn you wheels uphill or into the curb, just in case something of this nature was ever to happen. Most modern cars employ some type of accelerator kick-off mechanism to release the brake catch when the accelerator is depressed. Take a close look at the operation of this part of the brake system as well.The specifics of functionality will be addressed in your car’s service manual. If your accelerator pedal is out of adjustment in relation to the brake pedal kick-off linkage, proper operation of the hill brake system may be impaired. Next time, we will cover the brake shoes, drums, and the adjusting mechanisms. If your brakes do need adjusting immediately, remember that the brakes should always be adjusted at the shoes, not at the cables. Adjustments made at the cable causes excessive wear at the very bottom of the shoes leading to a very hard pedal (you must press the pedal very hard to get the brakes to activate). Improper cable adjustment will not allow the self-adjusting mechanisms to work as intended. The cable adjustment is intended to set the proper tension for the hill brake pedal to hold the car in park, not to adjust the entire brake system. We strongly recommend consulting an OEM service and repair manual for full safety, inspections and procedures. We at The Golf Car Catalog and Mountaintop Golf Cars, Inc. are in no way liable or responsible for improper repair or misdiagnosis of pending failure as a result of this published information. Furthermore, we recommend a factory trained technician perform brake, steering, and other critical or safety related repairs. This short guide is merely intended as a staring point for evaluating the possible need for further brake system repair, not as a definitive explanation of how to make these adjustments.